This superbly presented large 5-bedroom, 4-bathroom detached family home comes to the market with no upward chain. 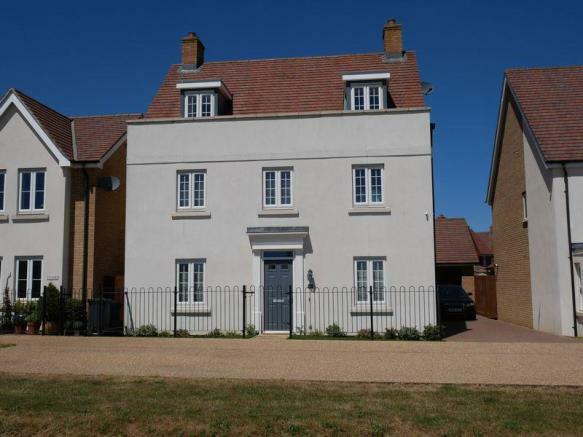 Originally built in 2011, this is a fantastic example of the largest Taylor Wimpey house type available on the King’s Reach development. Located at the end of a private road, with rare open views to the front, the property benefits from an oversized garage with a long drive and additional private land to the front of the property affording parking for up to 7 cars in total. 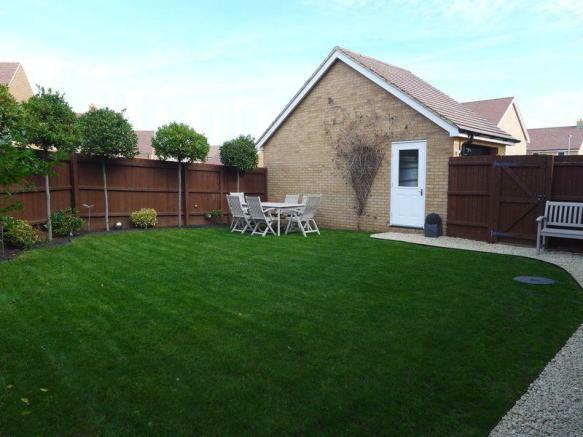 Ideal for both local families and commuters, Biggleswade is easily accessible from the A1, and less than 20 miles from both the M1 and Cambridge. Fast trains to London take less than 35 minutes from Biggleswade station, with new Thameslink services now operating to St Pancras, London City and Gatwick Airport, alongside other fast services to Kings Cross. 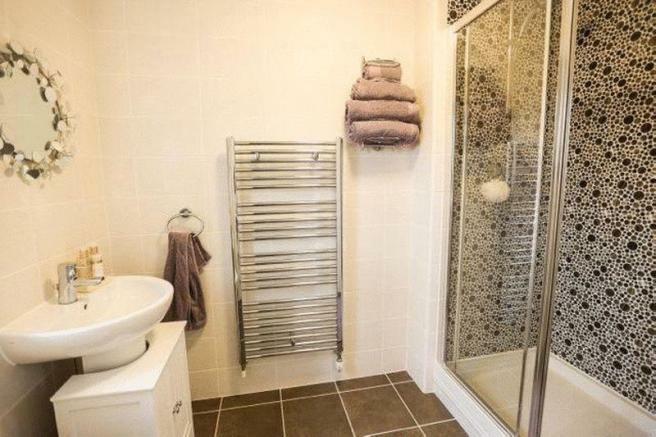 On the ground floor, the property has three reception rooms along with kitchen/breakfast and utility rooms. The spacious lounge has french doors opening onto the private garden, and glazed doors through to the dining room. There is also a separate study. The kitchen benefits from upgraded granite worktops, floor tiling, kitchen units and AEG appliances, with downlighters throughout, under-cupboard lighting, and a separate utility with its own access to the drive. On the first floor, the master bedroom has a walk-in dressing area and a large en-suite, the generous guest bedroom also has a large en-suite along with ample wardrobe space, and there is also a third double bedroom and a family bathroom. On the top floor, there are a further two double bedrooms and a shower room, making this an ideal space for older children. Outside, the long driveway leads to a larger than standard garage with its own power and lighting, a personnel door, and a fitted workbench at the rear. Fibre broadband is available at the property along with a developer installed Sky dish and an alarm. * Nurseries, lower, middle and upper schools. * Local shops including Sainsbury’s Local, Co-op, Post Office, and others. * Pharmacy & doctor’s surgery. * Pubs, community centres, restaurants & takeaways. The new A1 retail park (Marks & Spencer, Next, Argos, Boots, Laura Ashley, TK Maxx etc) is a mere 15-minute walk away.Local facilities include Saxon Leisure Centre with an 8 lane 25m swimming pool and an excellent gym with over 100+ state of the art fitness equipment positions. Early viewing is recommended as this type of property is highly sought after and rarely comes to the market. Disclaimer - Property reference 9128437. The information displayed about this property comprises a property advertisement. Rightmove.co.uk makes no warranty as to the accuracy or completeness of the advertisement or any linked or associated information, and Rightmove has no control over the content. This property advertisement does not constitute property particulars. The information is provided and maintained by Doorsteps.co.uk, National . Please contact the selling agent or developer directly to obtain any information which may be available under the terms of The Energy Performance of Buildings (Certificates and Inspections) (England and Wales) Regulations 2007 or the Home Report if in relation to a residential property in Scotland.